Are “free fees” a pipe dream? According to former NUI Galway president Dr James Browne the idea of free fees is “naïve”. He told the Irish Independent he sees a figure of €5,000 per annum as a starting point, with higher frees for science and engineering courses unless industry is willing to voluntarily subsidise the costs of those courses down to €5,000. 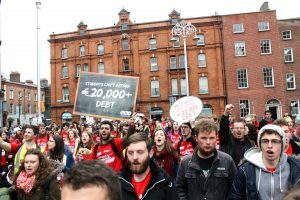 The abolition of fees for higher level education is a widely-supported view among higher-level students in Ireland with a campaign lead by the Union of Students in Ireland (USI), and generally speaking, few students relish the prospect of further increasing the costs of education. Therefore, it was not surprising that the reactions to those comments were almost uniformly negative. However it is worth exploring whether Dr Browne has a valid point here. While Irish students do have the second-highest fee rates in Europe, according to the European Commission, this doesn’t account for the fact that a large proportion of the student body – including almost half of students in NUI Galway – do not pay the full amount of those fees, and some do not pay any fees at all. Presently, free fees functionally exist for those from many lower-income backgrounds – although the fact remains that student fees are far from the only costs related to education. Some critics of a free fees policy could point out that, in the current context in Ireland, the abolition of student fees would benefit students from the middle and upper class families who don’t currently qualify for financial support or subsidies from SUSI. Such funds might be better spent on increased academic support in Secondary Schools, or increased maintenance grants, which would seem to more directly target the structural economic and social disadvantages which prevent people from currently accessing higher level education. Of course, advocates could respond that public funds aren’t a zero-sum game – there technically is no reason why the government can’t increase taxes across the board. Consequently, there could be adequate funding for higher-level education – even without charging fees for Irish students, as well as to invest in educational, welfare and infrastructure projects that can reduce inequality overall. The current political context, however, would suggest otherwise. Regardless of some noises and minor social policy changes Fine Gael supporters can point to, there does not seem to be an appetite for the Government to further increase taxation. For the sake of significantly increasing investment in education, this allows both of the above outcomes to be achieved to any satisfactory degree. If anything, there are more political incentives for the Government to pursue tax reductions, where they can afford it. That is not to say that the entire campaign for free higher-level education is fundamentally misguided, or that we should accept Dr Browne’s view on reality. If anything, one of the main aspects of the free fees campaign is to change that overarching reality that guides how decisions relating to our education system are made. The rationale behind the campaign to abolish fees for higher level education is similar to why many would find the idea of allowing for free Secondary School education on a means-tested basis objectionable. The belief, in this case, is that education should not be a commodity, but a social right we grant to citizens, to allow them to fully develop their intellectual and academic potential. Even thought the current political environment within Ireland does not seem conducive to applying that same sort of ideal to higher-level education, as we saw in the case of the bank bailouts, Irish Governments are willing to put down a lot of public money if there is an interest group with strong enough “pull”. And at present, it is clear that students are not among the most influential interest groups lobbying the Government for funding. Strong and persistent lobbying on behalf of the policy preferences of students is one way to start to shift attitudes towards students by the Government. Even if it doesn’t result in the abolition of student fees, it does send a message outlining how students would not be willing to tolerate expensive fees of any sort, whether they be €10,000, €5,000 or, indeed, €3,000.